Well, well, well. Big bad Boston has another wedding coming up! 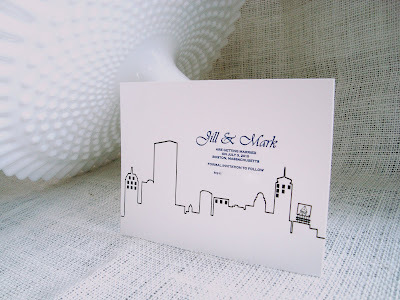 Jill reached out to me to help her create a perfect Boston skyline, save-the-date, for her July wedding. The image was designed by a nearby designer, Joe, and embellishments to make it more 'Boston' were added-- c'mon, that Citgo sign is critical. The 6x4 cards were letterpressed onto 110lb Crane Lettra, pearl white, 100% cotton paper in violet-infused blue and black.